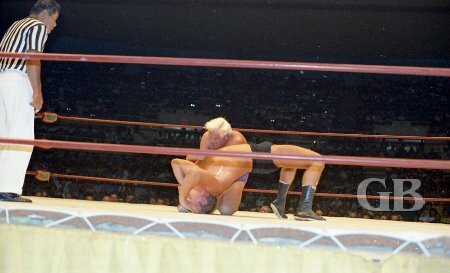 On July 15, 1970 two world title matches, a North American title match, and four other matches headlined a professional wrestling card presented by Ed Francis at the Honolulu International Center arena. In the opening event, Kenji Shibuya defeated Tank Morgan. 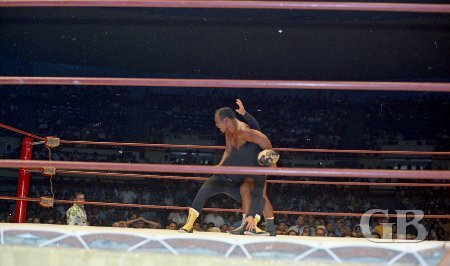 In other matches, Billy Robinson downed Killer Karl Kox and on a ladies match, Vicki Williams defeated Fran Gravette. 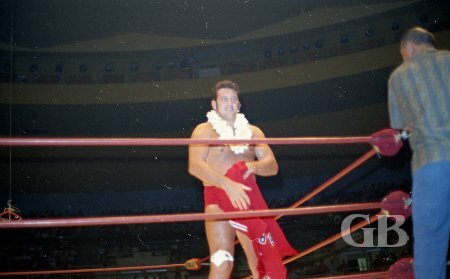 A relaxed Fran Gravette sits on the top turnbuckle while waiting for Vicki Williams to enter the ring. Fan's favorite Brit, Billy Robinson. Killer Karl Kox applies a vertical suplex on Billy Robinson. 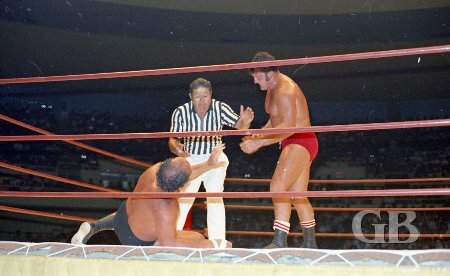 Kox begs for mercy from Robinson as referee Wally Tsutsumi looks on. Vicki Williams grasps both of Fran Gravette's legs and contemplates a possible Boston Crab hold. In a tag match, Sam Steamboat and Hahn Lee defeated the duo of the Masked Assassin #1 & #2. Assassins #1 and #2 approach the ring. Sam Steamboat applies the Abdominal Stretch on one of the Assassins. The first championship match of the night had The Fabulous Moolah successfully defend her World Woman's title against Toni Rose. The Fabulous Moolah sizes up Toni Rose against the ropes as the ref counts. 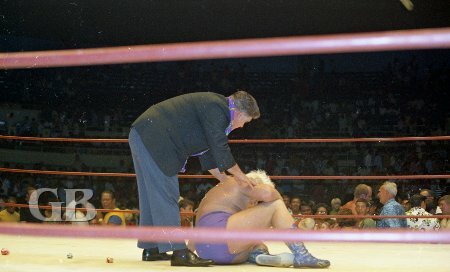 In the match for the North American Championship, Handsome Johnny Barend retained his title when challenger Pedro Morales was disqualified for hitting referee Pete Peterson. Johnny Barend puts an arm lock on a downed Pedro Morales. 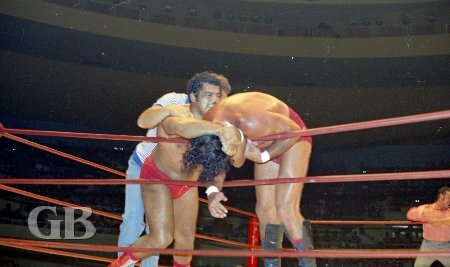 Morales chokes Johnny Barend over the top ropes. 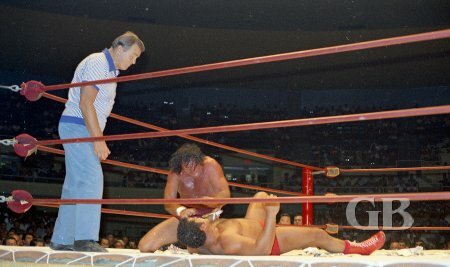 Pedro Morales takes a short breather after slamming Barend's head into the turnbuckle. Johnny Barend goes into "psycho" mode and starts chewing paper. 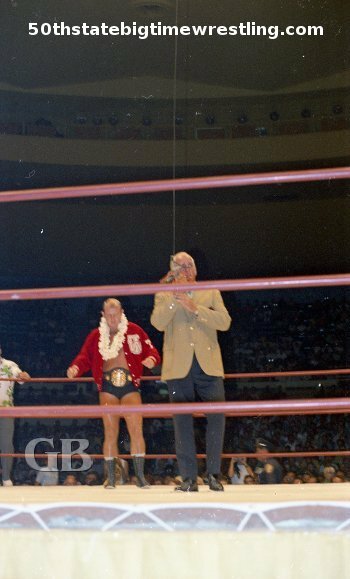 The main event had NWA World Champion Dory Funk Jr. put his title on the line against current Hawaiian Champion Ripper Collins. Funk won the first fall, Collins evened up the match with an atomic drop followed by a pin fall. Funk retained his title by winning the third fall with a spinning toe hold submission hold he applied on Collins who submitted quickly. 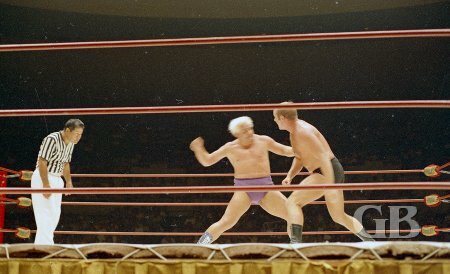 Lord Tallyho Blears introduces World Champion Dory Funk Jr.
Funk tries to bridge out of Ripper Collins' armlock. 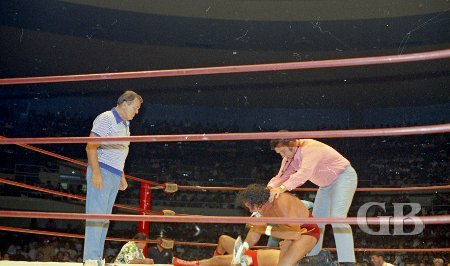 Coming off the ropes, Dory Funk Jr. is about to run into Collins' "Georgia Five". Valet Friday Allman comforts a dejected Ripper Collins after losing the third fall and the match.